This summer was a summer of hard work but also fun. In June 2013, I joined a friend in creating a blog about the book and movie, “The Fault in Our Stars.” We had a huge passion for the story, along with brewing excitement and nervousness about our favorite book being turned into a movie. Not all book adaption films do justice to the original material. We decided that the best way to deal with the excitement was to follow every single step of the process. Needless to say, we were successful with more than 1 million views, 100,000 followers on Twitter and 50,000 followers on Tumblr. Filming started August 26, 2013, coincidentally the first day of class. I remember being in class and on Twitter and ready to retweet any tweets or news from set (sorry, professor!). With this blog I was able to apply skills I learned in my public relations classes. In my head I could hear Ann Christiano, professor of PR strategy and public interest communications, going over engaging with our audience and understanding what they need and want. I also learned a lot of new things that you can only get from actually doing. I learned to use social media as more than a personal tool of socializing, but also as a way to inform and communicate with others who care about the content you put out. I did a lot, and I mean a lot, of writing. I collaborated with a graphic designer in making original graphics for the website. I was interviewed by Yahoo! Movies and the Los Angeles Times to discuss the blog and the passion behind this amazing story. This blog was a lot of sweat, a lot of tears, a lot of late nights, but it was a joy. We were fortunate to work with 20th Century Fox and attend events as press. In Miami, I got the chance to talk to John Green, Ansel Elgort, Shailene Woodley and bond with Nat Wolff over the Floridian heat. I was also able to travel to New York for the world red carpet premiere and talk to cast and crew. It was a once in a lifetime experience, personally and professionally. I look back and I am amazed at what I and the team, who were so passionate about a story, accomplished on our own. I am and will forever be proud of this project. I don’t know what is next for me, but one thing is for sure, I can only go up from here. Fall Membership Rally at 6:15 p.m. on Wednesday, Sept. 3! UF PRSSA is gearing up to hit the ground running with our first meeting of the semester. Check out our Facebook event page to RSVP and keep up to date with the location of the rally. We booked Weimer G037 (in the basement) for the meeting but due to changes in room reservations for Drop/Add Week, the location may change. We'll be providing an assortment of food to enjoy while you learn about upcoming events, ways to get involved, as well as all of the great things PRSSA has planned for the upcoming semester. 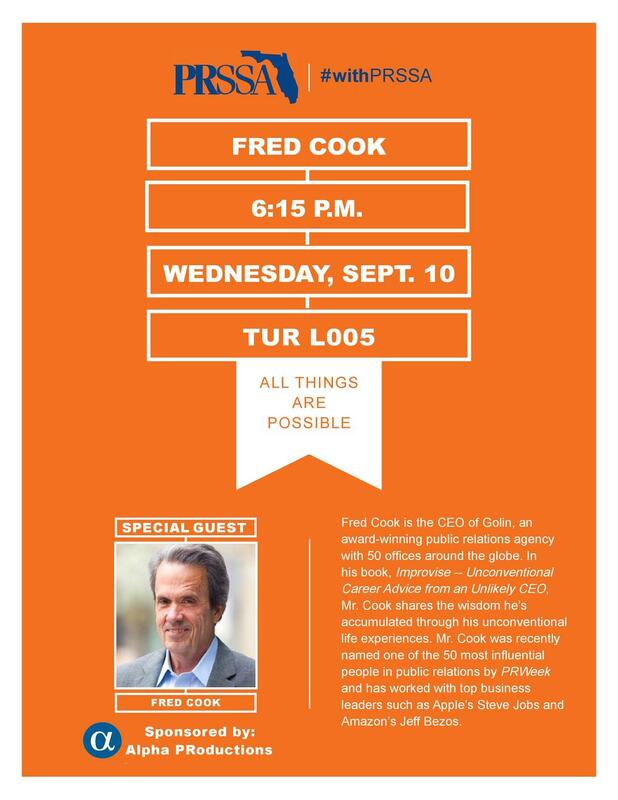 If for some reason you cannot attend but would still like more information, email us at ufprssa@gmail.com. Kirvin Doak Communications is looking is in need of several entry-level account coordinators in their Nevada offices. Email AMonaghan@kirvindoak.com or go to http://www.kirvindoak.com/ for more information! 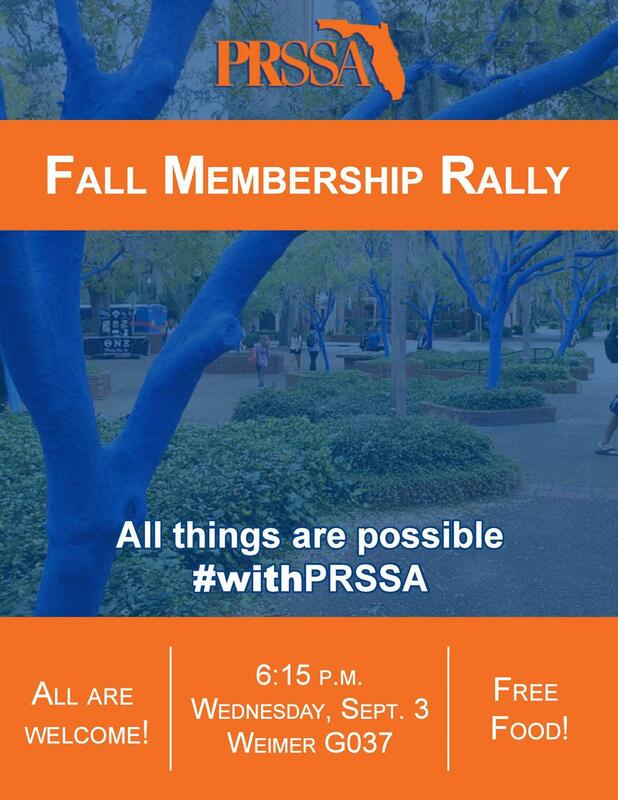 Want to get more involved in UF PRSSA? We have an opening available- Apply to become our next Director of External Relations today! For the general application, click here. For the election packet and requirements, click here. By Sarai Cruz It is officially summer-internship-searching time and in the communications field, unpaid internships are the norm. They are easier to find compared to paid internships, but don’t let the lack of monetary compensation deter you from learning all that you can from a really great internship. Last summer, I was the intern for The Riviere Agency, a New York and Miami based fashion and beauty integrated marketing agency. The internship was unpaid, but I don’t regret it. Yes, it was hard to work without getting paid but I survived those eight weeks. First, I saved money beforehand. I knew that finding a summer job while doing an internship was going to be really hard, so thankfully I had saved enough money during the school year to cover expenses. Secondly, I picked an internship in a location that wouldn’t create excessive cost. My internship took place in my hometown of Miami, which meant I didn’t need to worry about housing and transportation. Most importantly, I understood that monetary compensation isn’t everything. For example, I was able to work during Mercedes Benz Swim Week, which meant lots of swag bags and free samples. Plus, experience and knowledge are more valuable than money. I am so thankful my boss made sure I was able to absorb as much as I could, from writing a media alert to producing a television segment. She understood that I was more than someone she could ask to go to Starbucks and grab her latte. So as you send in your applications and resumes for those summer internships, remember to do your research and don’t let the paid or unpaid label deter you from it. As the debate whether employers should offer unpaid internship to college students heats up, keep these tips in mind. I had the opportunity to “Meet the Media” at a luncheon with the North Florida PRSA chapter in Jacksonville on Wednesday Oct. 16. Our parent chapter invited leading people in the media so practitioners could develop contacts with the people that they could potentially pitch ideas to for their clients. The event was extremely beneficial to me as a public relations senior because I was able to see how I could connect with local media in my career. I gained valuable insight and was able to network with local professionals who actually practice the skills I’m learning about. During the session, I heard a number of ways the media likes to receive pitch ideas and how we could effectively send out press releases. Public relations is such a diverse field that we as future practitioners should prepare to expect almost anything. After graduating, I would strongly consider joining a chapter of PRSA. The meetings are usually scheduled once a month, and the networking opportunities are truly amazing. Just at the one luncheon I met so many interesting people and talked with fellow Gators. I heard personal experiences and found that my public relations degree can take me anywhere. Diversity in the workplace is inevitable. At last Wednesday’s UF PRSSA meeting, Lori VanNess explained the role of diversity in the workplace and Jarrod Cruz related these roles to his position on campus. VanNess, the AT&T associate director of retail sales operations said her company defines diversity as “something you can see.” You can see when someone looks different, she said. She went on to explain the importance of making employees feel included through the company’s 11 employee resource groups. Cruz, the director of intercultural engagement within UF multicultural and diversity affairs, describes diversity as broad and complex differences between people. He said he believes these differences are brought on by the multiple identities that people can have. He said we maintain these identities through factors like family, values and religion. When asked about the different cultural subgroups at UF, Cruz explained the groups all come together under certain organizations. For example, the Institute of Black Culture tends to bring together the other black organizations on campus through communication. He stressed that the diverse organizations must communicate with one another in order for them to be productive. This is similar to in the workplace. VanNess explained AT&T employees come together during employee resource groups to discuss projects that include the other departments. This brings everyone together in an efficient manner. According to VanNess, as a part of AT&T’s goal to create a more diverse workplace, the company has been focusing on recruiting women and people of color from a regional level. “We just want to make sure that everybody is being represented,” she said. She said she sees how many of these people have been promoted. In the past, white males have seen more promotions, but the company is trying to create more balance and provide opportunity for advancement to all employees. Cruz’s take home piece of advice for students looking to be more diverse to employers is to immerse themselves in different cultures. He advised students to develop their multicultural understanding and competence through expanding their social circles. Cruz said in order to do this, students must step out of their comfort zone. For example, they could attend a meeting full of people who look different from themselves. He said this will help develop students’ cultural understanding. Cruz stressed that now is the time for them to take advantage of the diverse environment UF has to offer. VanNess advised students to get involved with different communities. She said this will help students get to know obstacles they could be faced with in bringing together people from diverse cultures and backgrounds. She said this will help you learn to adapt how you act no matter what community you work in. Both speakers brought great advice and insight to the panel. They encouraged students to get educated in diversity now, while they still have the opportunity take advantage of the diverse UF campus.